Hail Selassie I se h any country that used agriculture as the main source of income……..
close you feed you, shelter you. 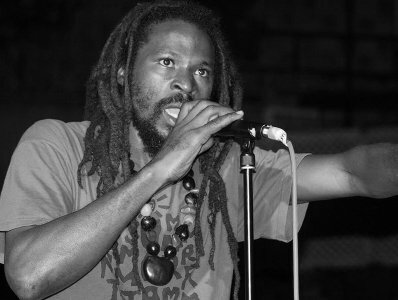 Because…I’m a man of the past…..
living in the presents and stepping in the future……..
RasTakura- founding member of Royal African Soldiers, nominated for the International Reggae and World Music (IRAWMA) award in 2011 – Dub Poet of The Year. His work covers not only modern issues but critical ones that need to be brought to the forefront. He performed on Word Sound Power that was featured on BETJ. He is a Jamaican Reggae Dub Poet, recording and performing artist, Farmer, Painter, conscious Rastaman residing on the country side of the island of Jamaica. RasTakura gains his inspiration from H.I.M. Haile Selassie I, Marcus Garvey, Mutabaruka, Andrea Williams-Green and Capleton. RasTakura’s agricultural and environmental roots were deepened at the Knockalva Agricultural School, and the College of Agriculture, Science & Education (CASE). In 2003 Takura was featured on the Multicast Poetz CD – a compilation album with Mutabaruka, I-Nubia, Steppa, alongside Neto & Ginsu – produced by Mackonen Blake Hannah & Eric Dixon. He has been featured on T.V.J, CVM TV, as well as in several local print medias such as: The Star, The Gleaner and The Observer Newspapers. He is “A Potent, Afrocentric Political Poet with a cause” – Rooted with two underground compilation CD’s, Run-Away-Slaves & Dragon Slayers, and a DVD, produced by C.P.T.C. RAS Poetz. RasTakura was born, and still resides in the beautiful parish of St. Ann, in a small community neighboring Nine Miles, the home of Reggae Legend Bob Marley. He spent his earlier years growing up on a farm with his Grandparents then later lived with his single mother in a neighboring District. He recognized his talent while attending Bensonton All Age School where he gladly used the opportunities given to perform on every school and community concert as a Dancehall Deejay. He has performed on some of Jamaica’s major shows including Reggae Sumfest, St. Mary Mi Come From, Capleton & Frenz, Fiwi Sinting, Rebel Salute ‘07, Heineken Startime, plus numerous appearances in schools, Colleges and Universities across the island. He is the founder of Dis Poem Word Fest, an all day Poetry festival going on its 4th year on CASE campus and is also the founder of Caribbean Griots Speak, a forum for Carribean writers. Look forward to the voice of the future, living in the present. Look forward to the upcoming ‘Food War’ album. Look for RasTakura.